A Tamil lawmaker became leader of the opposition in Sri Lanka’s parliament for the first time in 32 years on Thursday, in the latest sign of progress towards ethnic reconciliation on the once bitterly divided island. Rajavarothiam Sampanthan is the first lawmaker from the ethnic minority to lead the opposition since 1983, when Tamil legislators resigned en masse to protest against a statute that compelled them to denounce separatism. 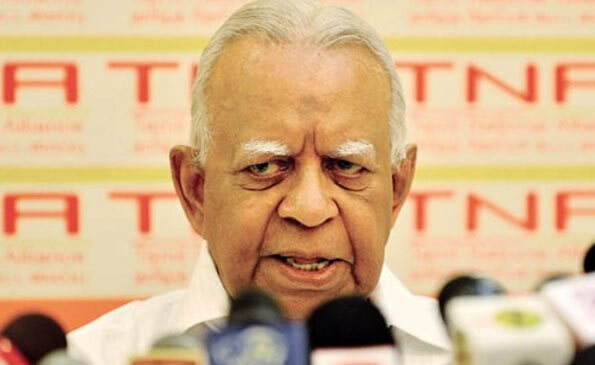 The 82-year-old moderate heads the Tamil National Alliance (TNA), which emerged from last month’s election as the third-largest force with 16 seats in the 225-member assembly. “We shall be loyal to this country and the people of this country,” Sampanthan told the House on Thursday. Sri Lankans voted overwhelmingly in last month’s polls to continue what Prime Minister Ranil Wickremesinghe called the “January 8 revolution” in reference to the toppling of long-time leader Mahinda Rajapakse. The former president won huge support among the majority Sinhalese community for defeating Tamil guerrillas who waged a long separatist insurgency on the island, but was blamed for failing to bring about ethnic reconciliation in the aftermath of the conflict. Wickremesinghe’s new government has pledged to work for unity in Sri Lanka, which still bears the scars of the decades-long civil war between separatist Tamil guerrillas and the state. His United National Party (UNP) will govern in coalition with the United People’s Freedom Alliance (UPFA), which was in opposition until the latest election. Parliament voted overwhelmingly on Thursday evening to have a 48-member cabinet that will be sworn-in Friday. The UNP is to take the majority of ministries while the others will go to UPFA lawmakers. But a splinter group has remained loyal to the UPFA’s best-known member Rajapakse, who oversaw the crushing of the Tamil Tiger guerrillas that ended the war in 2009, and chosen to remain in opposition. They opposed Sampanthan’s appointment, arguing that the UPFA as the second largest party with 95 seats should lead the opposition. However House Speaker Karu Jayasuriya rejected that, saying the UPFA’s formal leadership was committed to joining the administration to form a broad national government. Sri Lanka’s President Maithripala Sirisena won power in January promising reconciliation and accountability for alleged war crimes committed by troops under Rajapakse’s command. This week he urged the new parliament to make “difficult political decisions” to bring about ethnic reconciliation six years after the end of the war between Tamil separatists and the state. “Even at this late stage, we should take the difficult political decisions to ensure ethnic harmony and bring about reconciliation,” Sirisena said in an address to parliament outlining the new government’s agenda. The UN Human Rights Council will this month produce the results of an investigation into war crimes said to have been committed in Sri Lanka over six years ago. The new Sri Lankan government plans to carry out its own domestic inquiry into the alleged atrocities, which the TNA has said it would support. The alliance is also pressing for a new constitution to “restore democracy and justice”. However, some of its constituent parties are pressing for an international investigation into allegations that at least 40,000 Tamil civilians were killed in the final months of the war, storing up potential political difficulties for Sampanthan. The United States had been pressing for an international inquiry, but said last week it would back the new Sri Lankan government’s plans. It says the new administration in Colombo should be given more time to ensure justice and restore democracy after a decade under Rajapakse, who was shunned by many world leaders. Washington had an uneasy relationship with Rajapakse, who staunchly defied Western pressure to investigate allegations of atrocities. The former strongman had insisted that not a single civilian was killed by troops under his command during the decades-long conflict. The appointment of a leader of the opposition from a minority party (Federal Party) could spell disaster to the country. Appapillai Amirthalingam was appointed Leader of the Opposition in 1977. he took to the stage in the heart of Colombo in various venues including the Ramakrishna Mission, to deliver a thunderous message on the Valvettithurai Resolution calling for separation. We all remember the ethnic blow-up in 1977 which was eventually dealt with through a requirement for allegiance to the unitary state, in parliament. In his speech as Leader of the Opposition, Hon Sampanthan has advocated regionalisation of the administration. This is contrary to the wishes of the peoples of Sri Lanka. An ethnic blow-up is unlikely given the maturity of the majority Sinhala speaking citizens. However, ideas such as these, are likely to be picked by International do-gooders. By just appointing someone as a leader to forget the existing problems wont work. Appointing Mr. Sampanthan was done at the wrong moment. The Tamil problem has to be solved not by bribing, it should be done genuinely and it should reach the victims and just not politicians. Using the word “Minority” is not an insult, if you can say first Tamil to be appointed in 32 yrs, then of course you can reply to explain that the Tamils are a minority. By the way if you say there is nothing called minority and majority, then why only two tamil members in the new cabinet. We are making arrangements for a huge protest against the decision of domestic probe . We always believe internal missions would lead to the favour of MR. We as far as our concern , have been innovating all over the globe for this mission, at this point of view US is cheating and supporting the present govt.